Dropsy in goldfish is a challenge for owners worldwide. Before we discuss the technicalities and actual treatment it’s important to understand one crucial aspect of the “disease” itself. It’s actually not a disease but a bacterial infection that causes excess waste and fluid to store in the stomach or kidneys of the goldfish. There’s very little information about its cause. Some attribute the condition to bad water temperature regulation while others simply blame diet as the culprit. Fish become susceptible when their immune system has been compromised. Generally by a stress factor. Maintaining a healthy tank is most important to avoid this sickness as healthy fish rarely develop dropsy. The good news is fish can recover from dropsy with the correct treatment and early diagnosis. If your fish has swelling in any part of the body (especially their eyes and stomach) it’s very likely to have dropsy. If the disease is treated in very late stages, the chances of reversing the condition and potentially saving the goldfish, (Betta or Koi) is low, so the earlier treatment is started, the better the chances of survival. There are a few approaches to treating this condition. Often dropsy is caused by internal bacterial infections. It’s important to monitor your aquarium conditions often to prevent any deficiency that can potentially lead to dropsy. In most self-help articles and clinical research regarding Dropsy in fish, isolation is recommended. Most fish suffering from Dropsy will act very differently to their healthy counterparts. By isolating your goldfish you can treat him or her in a controlled environment without dealing with exterior factors. There are several known treatments for Dropsy however none have proven to be 100% effective. Therefore trying different treatments over a period of time will increase your chances of successfully curing your fish of this condition. To treat the entire aquarium the recipe is to add 1 tablespoon of salt to the water for every 40 liters of aquarium water. This salt is known to cleanse, and reduce excess waste accumulated by the goldfish. With this treatment it’s important to use the correct measurements to avoid danger to the fish. You can bathe just 1 fish in epsom salts. In this case use 10 grams per liter of aquarium water. Bathe your fish no longer than 30 minutes. This can be done once or twice in a day. Some bacteria can reproduce or spread faster depending on the temperature. Water temperature is one of the many attributed causes of dropsy. It’s important to regulate the water. The temperature range for goldfish is 68 to 75 degrees, and some prefer even warmer temperatures. Unlike the first treatment, Augmentin is directly fed to the goldfish. These medicine tablets have been shown to successfully cure dropsy. It’s important to enhance the effect of this treatment by also offering your fish medicinal food. Click here to buy antibacterial treatment for fish. Unfortunately dropsy is a mysterious and common disease that may not always be curable. 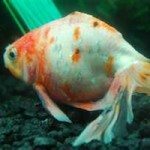 As always, it’s best to prevent the disease in the first place by following some of the tips offered on this site and constantly monitoring your goldfish environment, diet and overall health appearance. Check out this video. I’ll warn you, it made me a little squeamish, but if something works I’ll do it to heal my goldfish. In the video, the 2 sick goldfish became lethargic and stopped eating. One of them also has dropsy. Antibiotic injection is a cure that can work. Ceftazidime a the broad spectrum antibiotic with low renal toxicity. The dose used in the video was 0.1 ml (~20 mg) intramuscularly. The solution was drawn into a tuberculin syringe with a 30G needle. The location of injection was at the middle of the goldfish back between the saddle and midline of the body. The needle was pointed ~45 degree between scales. You can also treat the tank water with antibiotics to stop the spread of bacterial disease. Click here for a link to medication.